Are based on polyclonal antisera raised in sheep. Are standardised using International standards for total IgG, IgA and IgM. Undergo rigorous testing during assay manufacture to ensure the quality of the kit components. 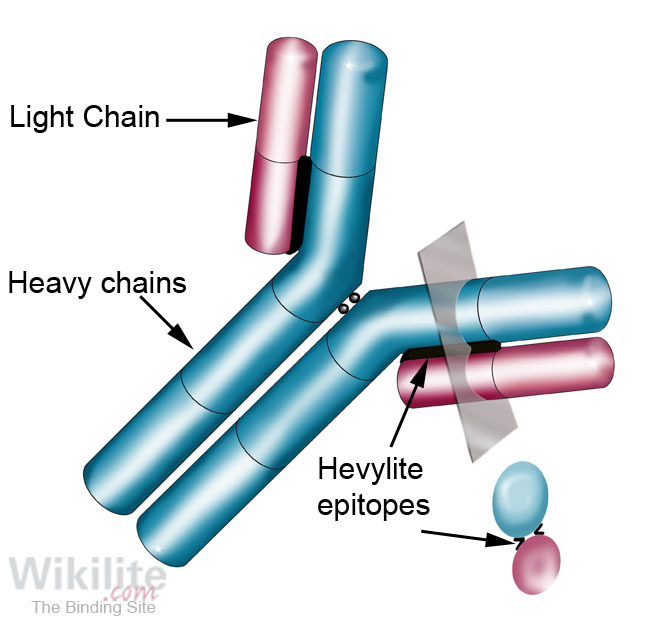 Intact immunoglobulin molecules contain unique junctional epitopes across the heavy chain and light chain constant regions that are the target of heavy + light chain isotype assays (Hevylite, HLC) (Figure 9.1) . HLC assays quantify the different light chain types of each immunoglobulin class, i.e. IgGκ, IgGλ, IgAκ, IgAλ, IgMκ and IgMλ (Figure 9.2). These molecules are measured in pairs, e.g. IgGκ/IgGλ, to produce ratios in the same manner as serum free light chain (sFLC) κ/λ ratios. As with Freelite® sFLC immunoassays, polyclonal antibodies raised in sheep provide the most attracti ve method of recognising polymorphic immunoglobulin molecules. There are theoretically four HLC epitope regions per immunoglobulin molecule - one on each side of each heavy/light chain contact region. Multiple HLC epitopes enable immune complexes to form readily, allowing homogeneous immunoassays to be produced that are suitable for turbidimeters and nephelometers. Latex enhancement is not necessary for IgG and IgA HLC assays, but is required for IgM assays.